happy october, everyone! october is one of my favorite months – it’s when the weather here starts to feel properly fall-ish, which makes me even more excited to do all sorts of cooler weather cooking + baking. so, it should come as no surprise that i’m introducing another slow-cooker recipe today – a true comfort food that’s ideal for the upcoming chilly autumn evenings: slow-cooker beef stroganoff. beef stroganoff is a favorite comfort food of many but, interestingly, i had never tried it until i ate this version i made myself. it’s one of my husband’s favorite childhood meals, so i told him i’d attempt making it, not knowing exactly what to expect. thankfully, we were both amazingly pleased with the results. it’s full of tender, juicy pieces of beef, flavorful, meaty mushrooms, + a wonderfully tangy, rich cream sauce. i served it over egg noodles + it was a delicious, stick-to-your-bones comfort food meal. and the leftovers? just got even more flavorful + complex. now that i’ve finally experienced the deliciousness that is beef stroganoff, it’ll be on regular rotation at our household! heat a large skillet over medium-high heat. add 2 tablespoons of olive oil to the pan + when hot, sear the beef (in batches, if needed) until browned on all sides. as the beef is seared, transfer to the crock-pot. 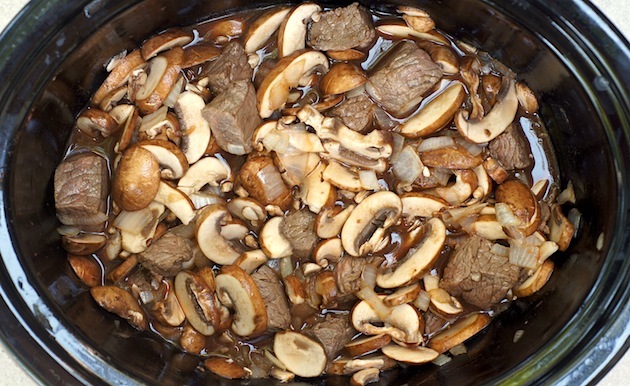 once all beef is seared + in the slow cooker, add in the mushrooms, onions, tomato paste, broth, mustard, wine + 3 tablespoons of the soy sauce. cover + cook LOW for 6 hours, or until beef is tender. in a small bowl, stir together sour cream, remaining 1 tablespoon soy sauce, cornstarch + black pepper; whisk into the hot meat mixture + cook an additional 30 minutes or until sauce has thickened slightly. serve over pasta or rice and garnish with parsley, if using. Beef straganoff is seriously the best. My favorite comfort food! Ooh, I’ve been excited to see this recipe! I definitely want to try it. Do you think I could replace the white wine with stock if I don’t have any wine on hand (terrible, I know)? The best! I love beef stroganoff, and now even more that i can make it in the slow cooker. yum! 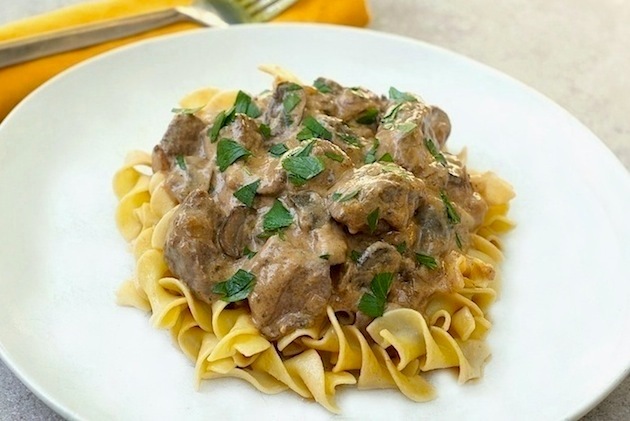 I love stroganoff but never tried it in the slow cooker. It looks great! the slow-cooker seals in a ton of wonderful flavor + makes the beef incredibly fall-apart tender. you’ll have to try it! This is definitely a meal my hubby would devour–and I love that you can make it in the crock pot! Looks great! This sounds like it’s just packed full of flavour; what a perfect Autumn meal. You are the slow cooker queen! And… guess who you encouraged to finally buy one?! 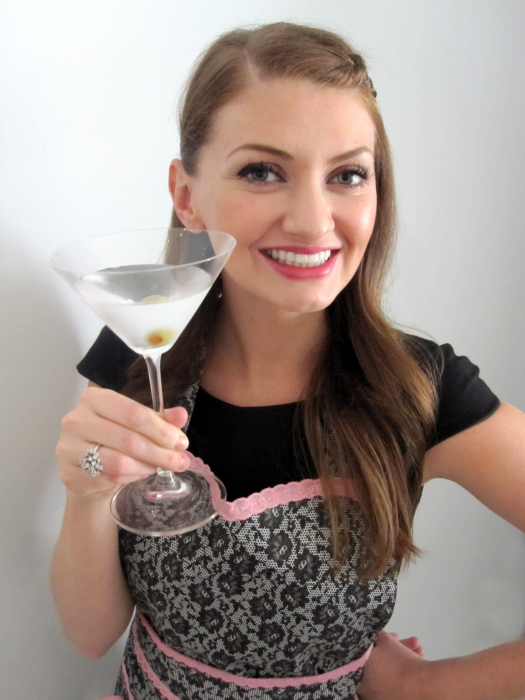 Yes: it’s in the mail, and I might just christen it with this gorgeous stroganoff! woohoo, I’m so glad I encouraged you to buy a slow-cooker! can’t wait to hear about all the awesome things you make with it! I’ve never thought to make beef stroganoff before! You’re so brave for trying it out for all of us though! I have a bad memory of trying beef stroganoff as a child, and I’ve honestly never thought of making it. Now, though, after seeing this, you have certainly perked my interest! Ooooo..I am likin’ your version. Totally amped up more than the one I made….cubed beef is more stroganoff-y than ground beef. This will soon be made on my typical put it in a slow cooker Tuesday meal. I love the photo with the mushrooms!! I need to start a pin board called, “Why I need To Just Buy A Slow Cooker ALREADY!” and this will be my first pin. I’m loving the slow cooker recipes! Ever since i got my timer to work on my slow cooker, i’ve been trying to think of a bajillion meals to make in it so i don’t have to rush around when i get home at night!! this looks amazing and i’m sure your house smelled awesome! I have never tried beef stroganoff but your recipe looks so good, I’m going to make it tomorrow night for dinner. I had never tried it before i made this recipe either + i just loved it! think beef stew, but creamier + tangier. =) can’t wait to hear how you like it! Looks fabulous! Perfect fall meal. I’ve never made it in a crock-pot before. I’m going to have to give it a try. i love beef stroganoff, but always make it with ground beef. i’ll have to give this a try! I know i’ve said this before, but I want to reiterate my love for your slow cooker expertise! Can you believe I’ve never had stroganoff before? That needs to change ASAP! i totally understand because i had never had it before i made this dish! if you like beef stew, i think you’ll love this – it’s got a wonderfully rich, tangy cream sauce which works perfectly with the super-tender beef + meaty mushrooms. yum! oh my! this is comfort food at its best, amy! great slow cooker recipe. This was my childhood favorite too!!! Love that you made this in a slow cooker-will add it to my recipe collection! Still no fall-ish weather here…more like record breaking temps, but this looks too delicious to pass up! P.S. Congrats on your cooking debut!!! This looks so good! I wish to have this for my lunch…great recipe! My husband requested stew the other day. We haven’t had it in years since the last time I made it, I got food poisoning. I have quite the aversion to stew-like stuff now. So maybe I’ll make this for him as something special. Sounds good. I love the slow cooker take you have on this classic dish, stroganoff is so delicious in cooler weather! Is it strange that seeing those mushrooms and beef in the crock makes me excited??? Not at all! First, it just shows that great minds think alike. =) and second, it shows that you have fabulous taste. Can’t wait to hear about your stroganoff dish! So, is it true that with slow cooker I can switch it ON is the morning to the prescribed time via cooker’s timer, leave for work, and when I come home, the food will be ready? I am convinced that I need to get one, especially now that I have 3 kids and have to go back to work in January Haven’t had beef stroganoff in a long time. This recipe looks terrific! yes, it’s true! the slow-cooker cooks on such a low heat that you basically just plug it in, put in the food, turn it on, + that’s it. you can leave it on while you’re out of the house, at work, running errands, etc. it really is a great kitchen appliance! thanks, Jen! Hope you make it soon + love it! and hope we *finally* get to meet up in person even sooner than that! Bookmarked! I love beef stroganoff and I love my slow cooker. Now you have me craving beef stroganoff. Looks like i will have to make a batch soon. Oh YES! Even as a kid, beef stroganoff used to be my favorite food! The ONLY thing different is I like mine without the tomato sauce and with a dollop of cream fraiche! amy, pinning this one to my crock pot board. Definitely trying this recipe! Looks fabulous. the last time i made it, I abandoned my own recipe just to try something different and the recipe was a complete bomb. Our meal tasted awful that night. So, besides mine, now a have a new variation. Can’t wait to try! Previous post: my first experience cooking on TV!